Each of us has a personal pattern in our relationship with food and more often than not it is determined by our lifestyles. There’s the business traveller who dines out a lot; the office worker, who eats at a desk; the mother who spends most of her time at home all day; or the shift worker who eats irregularly. It’s very easy just to grab some snack or meal that is quick and satisfies our hunger, at whatever cost to our daily calorie intake. It’s a sure way to pile on the pounds. Yet with a little awareness you can make automatic healthy, low calorie choices and find that you feel healthier, more satisfied and able to avoid putting on weight. You just have to use your imagination. What would be the more satisfying lunch? A large baked potato heaped with tasty broccoli and salsa for less than 20 calories more. A light, healthy lunch of 200 grams of white fish, poached with lemon, wine and herbs, with tomato salsa, green beans and 10 tiny new potatoes, all for 450 calories. Get the picture? Fresh fruits and vegetables are nutritious, provide fibre and staying power and are also low calorie, low fat and healthy. The flesh from a whole, small cantaloupe melon (around 300 grams) for the same calories. Two tablespoons of healthy hummus, made from chickpeas, and served with a plateful of raw vegetable crudités (such as peppers, carrots and celery) for 107 calories, fewer calories than 28 grams of Bombay mix. You may prefer some dried fruits or nuts or little cheese portions. It is fine to have these as long as you limit the portions to 28 grams. 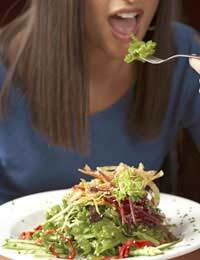 There are few foods that are off-limits entirely; but eating oversize portions will badly affect your healthy diet. Also it is important to note the fat content in recipes as well as the calorie values - and in that way, with just a few changes, you can go on enjoying your favourite meals. A large pork sausage, 25 grams of back bacon, 100 grams of tomatoes and 1 medium egg, all fried, with 1 medium slice of buttered toast, has 550 calories and 20 grams of fat. The same breakfast, using low fat pork sausage, lean bacon, and the tomatoes all grilled, together with one poached egg and toast with low fat spread, has 350 calories and 10 grams of fat. That has saved you 200 calories and a massive 10 grams of fat. A typical weekend lunch or dinner where we take time to enjoy a ‘proper’ meal, might include: 75grams of roast beef; 50 grams of Yorkshire pudding, made with whole milk; 170 grams of roast potatoes; 170 grams each of buttered carrots and sprouts; 2 tbsp gravy made with meat juices and fat in the roasting tin; and 2 tsp creamed horseradish sauce. This will amount to around 900 calories and 54 grams of fat. Make a few changes. Keep the same amounts, but use only lean meat; make the Yorkshire pudding with low calorie skimmed milk; have boiled or mashed potatoes; don’t add butter to the vegetables; make the gravy with meat juices only, no fat, and have plain horseradish sauce. Your meal then will be a low calorie 425, with only 15 grams of fat. Here are some examples of surprising calorie differences that might encourage you to take note of your current favourites and see where you might be able to make changes, without sacrificing anything in the way of taste or satisfaction. With practice, the awareness of food values will become automatic and you will soon find yourself making healthier choices. A Danish pastry has over 400 calories. Two Italian biscotti to dip in your coffee have a total of 180 calories. 28 grams of roasted, salted peanuts have 180 calories. One and a half cups of mixed, fresh fruits, is 60 calories. A kebab with 225 grams of lamb has 560 calories. A 225 gram kebab with half scallops and half mushrooms, with black bean sauce, is 150 calories. A small 28 gram serving of liver pate has 130 calories. For the same calories you can have 85 grams of smoked salmon with capers and cucumber.